The latest volume of the Research Methodology in Strategy and Management series uncovers theoretical developments in management and strategy, highlighting how firms succeed today, as well as offering cutting edge thinking on new and evolving research methods to study organizations. Standing on the Shoulders of Giants: Traditions and Innovations in Research Methodology collates a wide range of perspectives on strategy and management and introduces new approaches to researching organizations. 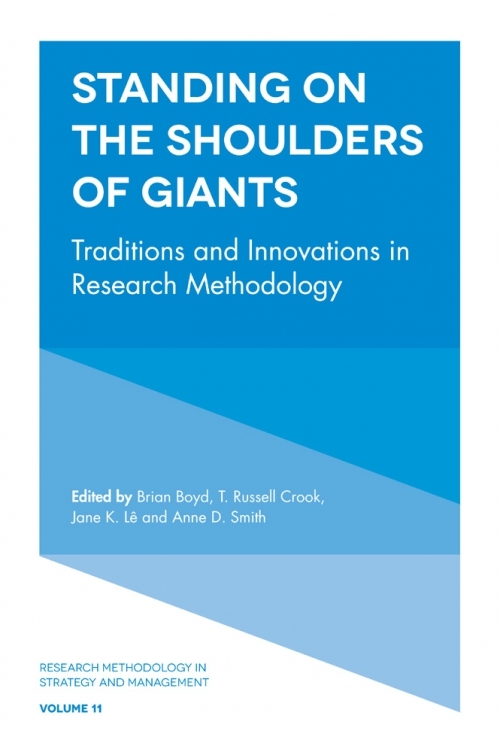 Two retrospective accounts from Kathy Eisenhardt and Denny Gioia provide contextual balance to the subsequent chapters which explore various research methodologies, including: qualitative comparative analysis, videometric methods, modes of process research, visual research methods and qualitative research in strategy. This culminates in a useful how-to guide which builds on insights about teaching aspiring entrepreneurs with a "canvas" and provides researchers with a canvas to design and execute high quality projects. This is an illuminating guide book for all academics and researchers working in the fields of management, strategy, international business, entrepreneurship and organization theory, interested in starting research projects. Brian Boyd is Chair Professor and Head of Management of the City University of Hong Kong College of Business. T. Russell Crook is the First Tennessee Foundation Professor in the Haslam College of Business at The University of Tennessee. Jane K. Lê holds the Chair of Strategic Management at the WHU - Otto Beisheim School of Management. Anne Smith is the King and Judy Rogers Professor in Business and Management Department Head at Haslam College of Business, University of Tennessee Knoxville.